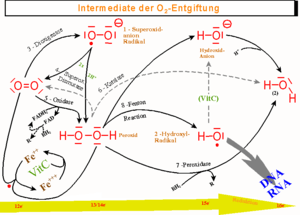 We have already described the key role that nitric oxide and the NO synthases play in reduction of oxidative stress. The balance that has to be regulated between pro- and anti-oxidative as well as inflammatory elements necessary for renal function, critically involves the circulation of the kidney. It poses an inherent risk in the kidney, where the existence of a rich circulatory and high energy cortical outer region surrounds a medullary inner portion that is engaged in the retention of water, the active transport of glucose, urea and uric acid nitrogenous waste, mineral balance and pH. In this discussion we shall look at kidney function, NO, and the large energy fluxes in the medullary tubules and interstitium. This is a continuation of of a series of posts on NO and NO related disorders, and the kidney in particular. In sepsis-induced acute renal failure, actin cytoskeletal alterations result in shedding of proximal tubule epithelial cells (PTEC) and tubular obstruction. This study examined the hypothesis that inflammatory cytokines, released early in sepsis, cause PTEC cytoskeletal damage and alter integrin-dependent cell-matrix adhesion. The question of whether the intermediate nitric oxide (NO) modulates these cytokine effects was also examined. the actin cytoskeleton was disrupted and cells became elongated, with extension of long filopodial processes. which was dependent on NO synthesized by inducible NO synthase (iNOS) produced as a result of cytokine actions on PTEC. with corresponding upregulation of integrin expression in clusters of cells elevated above the epithelial monolayer. These cells demonstrated coexpression of iNOS and apically redistributed β1 integrins. These authors point out that the major ligand involved in cell anchorage was laminin, probably through interactions with the integrin α3β1. This interaction was downregulated by cytokines but was not dependent on NO. They posulate a mechanism by which inflammatory cytokines induce PTEC damage in sepsis, in the absence of hypotension and ischemia. The data show that the apoptotic effects of proinflammatory stimuli mainly were due to the expression of inducible NO synthase. Cyclosporin A and FK506 inhibited partially NO synthesis. However, both NO and immunosuppressors induced apoptosis, probably through a common mechanism that involved the irreversible opening of the mitochondrial permeability transition pore. 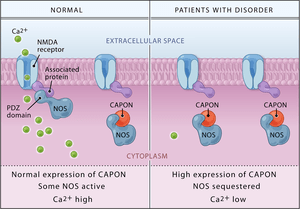 Activation of caspases 3 and 7 was observed in cells treated with high doses of NO and with moderate concentrations of immunosuppressors. The conclusion is that the cooperation between NO and immunosuppressors that induce apoptosis in PTEC might contribute to the renal toxicity observed in the course of immunosuppressive therapy. HORTELANO S, CASTILLA M, TORRES AM, TEJEDOR A, and BOSCÁ L. Potentiation by Nitric Oxide of Cyclosporin A and FK506- Induced Apoptosis in Renal Proximal Tubule Cells. J Am Soc Nephrol 2000; 11: 2315–2323. Endogenous sources of reactive nitrogen species (RNS) act as second messengers in a variety of cell signaling events, whereas environmental sources of RNS like nitrogen dioxide (NO2) inhibit cell survival and growth through covalent modification of cellular macromolecules. Murine type II alveolar cells arrested in G0 by serum deprivation were exposed to either NO2 or SIN-1, a generator of RNS, during cell cycle re-entry. In serum-stimulated cells, RNS blocked cyclin D1 gene expression, resulting in cell cycle arrest at the boundary between G0 and G1. 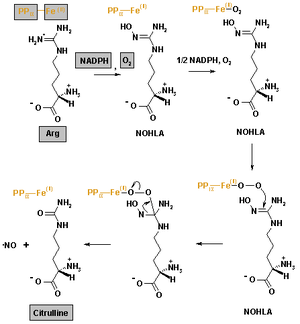 Dichlorofluorescin diacetate (DCF) fluorescence indicated that RNS induced sustained production of intracellular hydrogen peroxide (H2O2), which normally is produced only transiently in response to serum growth factors. Peroxynitrite (ONOO-) is a strong oxidant derived from nitric oxide (‘NO) and superoxide (O2.-), reactive nitrogen (RNS) and oxygen species (ROS) present in inflamed tissue. Other oxidant stresses, e.g., TNF-alpha and hyperoxia, induce mitochondrial, manganese-containing superoxide dismutase (MnSOD) gene expression. 3-morpholinosydnonimine HCI (SIN-1) (10 or 1000 microM) increased MnSOD mRNA, but did not change hypoxanthine guanine phosphoribosyl transferase (HPRT) mRNA. Authentic peroxynitrite (ONOO ) (100-500 microM) also increased MnSOD mRNA but did not change constitutive HPRT mRNA expression. ONOO stimulated luciferase gene expression driven by a 2.5 kb fragment of the rat MnSOD gene 5′ promoter region. MnSOD gene induction due to ONOO- was inhibited effectively by L-cysteine (10 mM) and partially inhibited by N-acetyl cysteine (50 mM) or pyrrole dithiocarbamate (10 mM). Treating cells with SNAP (0.1 or 0.25 mM) in addition to DQ produced synergistic cytotoxicity that minimized differences in apoptotic cell death and oxidative injuries between the KO and WT cells. Less protein nitrotyrosine was induced by 0.05-0.5 mM DQ+0.25 mM SNAP in the KO than in the WT cells. Total GPX activity in the WT cells was reduced by 65 and 25% by 0.5 mM DQ+0.1 mM SNAP and 0.5 mM DQ, respectively. Decreases in Cu,Zn-superoxide dismutase (SOD) activity and increases in Mn-SOD activity in response to DQ or DQ+SNAP were greater in the KO cells than in the WT cells. 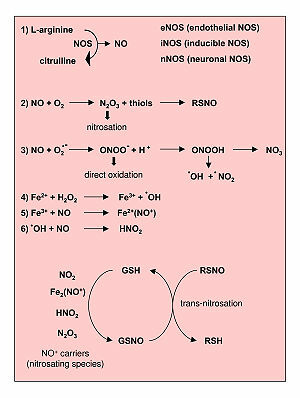 To better understand the mechanism(s) underlying nitric oxide (. NO)-mediated toxicity, in the presence and absence of concomitant oxidant exposure, postmitotic terminally differentiated NT2N cells, which are incapable of producing . NO, were exposed to PAPA-NONOate (PAPA/NO) and 3-morpholinosydnonimine (SIN-1). Exposure to SIN-1, which generated peroxynitrite (ONOO) in the range of 25-750 nM/min, produced a concentration- and time-dependent delayed cell death. In contrast, a critical threshold concentration (>440 nM/min) was required for . NO to produce significant cell injury. There is a largely necrotic lesion after ONOO exposure and an apoptotic-like morphology after . NO exposure. Cellular levels of reduced thiols correlated with cell death, and pretreatment with N-acetylcysteine (NAC) fully protected from cell death in either PAPA/NO or SIN-1 exposure. NAC given within the first 3 h posttreatment further delayed cell death and increased the intracellular thiol level in SIN-1 but not . NO-exposed cells. Cell injury from . NO was independent of cGMP, caspases, and superoxide or peroxynitrite formation. appears to be mediated by the loss of intracellular redox balance. Nitrogen dioxide (NO2) inhalation affects the extracellular surfactant as well as the structure and function of type II pneumocytes. The studies had differences in oxidant concentration, duration of exposure, and mode of NO2 application. Type II pneumocyte cell yield was only increased from animals that had been continuously exposed to NO2, but vitality of the isolated type II pneumocytes was not affected by the NO2 exposure modes. Continuous application of 720 ppm x h NO2 resulted in increased activity of the cytidine-5-diphosphate (CDP)-choline pathway. were significantly increased over those of controls. The authors conclude that type II pneumocytes adapt to NO2 atmospheres depending on the mode of its application, at least for the metabolism of PC and its secretion from isolated type II pneumocytes. Further studies are necessary to determine whether additional metabolic activities will also adapt to NO2 atmospheres, and if these observations are specific for NO2 or represent effects generally due to oxidants. The reader, however, asks whether this effect could also be found in renal epithelial cells, for which PC is not considered vital as for type II pneumocytes and possibly related to surfactant activity in the lung. This study analyzed the expression of inducible nitric oxide synthase (iNOS) and endothelial nitric oxide synthase (eNOS) in a mouse model of anaphylaxis. BALB/c mice were sensitized and challenged with ovalbumin to induce anaphylaxis. Tissues were removed from the heart and lungs, and blood was drawn at different time points during the first 48 hours after induction of anaphylaxis. The Griess assay was used to measure nitric oxide generation. Nitric oxide synthase expression was examined by reverse transcriptase polymerase chain reaction and immunohistochemistry. A significant increase in iNOS mRNA expression and nitric oxide production was evident as early as 10 to 30 minutes after allergen challenge in both heart and lungs. In contrast, expression of eNOS mRNA was not altered during the course of the experiment. The results support involvement of iNOS in the immediate physiological response of anaphylaxis. 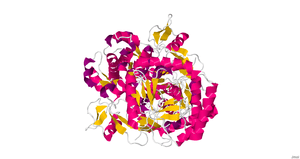 Synthase in a Mouse Model of Anaphylaxis. J Investig Allergol Clin Immunol 2007; 17(6):379-385. Nitrogen dioxide induces death in lung epithelial cells in a density-dependent manner. Persinger RL, Blay WM, Heintz NH, Hemenway DR, Janssen-Heininger YM. Am J Respir Cell Mol Biol. 2001 May;24(5):583-90. Molecular mechanisms of nitrogen dioxide induced epithelial injury in the lung. Persinger RL, Poynter ME, Ckless K, Janssen-Heininger YM. Mol Cell Biochem. 2002 May-Jun;234-235(1-2):71-80. Review. Nitric oxide and peroxynitrite-mediated pulmonary cell death. Gow AJ, Thom SR, Ischiropoulos H.
Am J Physiol. 1998 Jan;274(1 Pt 1):L112-8. Mitogen-activated protein kinases mediate peroxynitrite-induced cell death in human bronchial epithelial cells. Nabeyrat E, Jones GE, Fenwick PS, Barnes PJ, Donnelly LE. Am J Physiol Lung Cell Mol Physiol. 2003 Jun;284(6):L1112-20. Epub 2003 Feb 21. Peroxynitrite inhibits inducible (type 2) nitric oxide synthase in murine lung epithelial cells in vitro. Robinson VK, Sato E, Nelson DK, Camhi SL, Robbins RA, Hoyt JC. Free Radic Biol Med. 2001 May 1;30(9):986-91. Nitric oxide-mediated chondrocyte cell death requires the generation of additional reactive oxygen species. Del Carlo M Jr, Loeser RF. Colon epithelial cell death in 2,4,6-trinitrobenzenesulfonic acid-induced colitis is associated with increased inducible nitric-oxide synthase expression and peroxynitrite production. Yue G, Lai PS, Yin K, Sun FF, Nagele RG, Liu X, Linask KK, Wang C, Lin KT, Wong PY. J Pharmacol Exp Ther. 2001 Jun;297(3):915-25. The continuation of the discussion will be in essays that follow.